The only furniture store in the country that doesn't charge interest, finance charges, insurance or any extras. The belief in giving the customer the best possible deal to fit his pocket, together with the fastest delivery and best after sales service, has helped ensure unprecedented levels of loyalty. Because instalments at Railway Furnishers are lower our products are very affordable! Even if more time is needed to pay for the purchase, no charges are added to the original advertised price for the duration of the repayment period. Because prices are lower, the Instalment are lower. 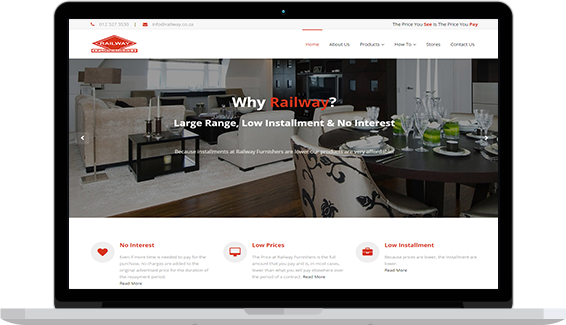 Railway Furnishers is the only furniture and appliance retailer in South Africa that offers customers the opportunity to purchase on account without adding any extra charges such as interest, finance charges, administration charges or any other compulsory charges normally associated with purchasing goods on account. That why their slogan is The Price You See Is The Price You Pay! Why Should I Buy From Railway? The price advertised is all you pay. Even if more time is needed to pay for the purchase, no charges are added to the original advertised price for the duration of the repayment period. Railway Furnishers will always consider your budget before closing the deal. What is the range of products? Railway Furnishers has one of the largest ranges of furniture, appliances and audio visual products in South Africa. Whether you are looking for a fridge, bed or a plasma TV, we will have what you want at a price you can afford.. We also have a large warehouse so we usually have items in stock. We offer a wide range of products. Everything from furniture, appliances and audio visual products to mobile devices and bedding. Remember, the price you see is the price you pay. We offer a full A range of clothing and footwear for men, ladies, boys and girls. At most times, there are specials running on items where large stocks have been purchased. Keep an eye out for that special item you might be looking for. Word of our specials gets out quickly. Existing customers are advised of specials by SMS. Throughout our 50 years we have always been dedicated to treating our clients with the utmost respect and delivering the best possible service aimed at not just satisfying but delighting! SMS the item you want to buy to 43657 - eg “TV” to 43657 and a sales agent will call you. Want to talk to an consultant? Contact us today and find out more about what Railway Furnishers can do for you. 387 Maltzan st, Pretoria West, 0183.